Consecutive hot weather has helped salt makers boost output and improve income in the Mekong Delta. Presently, farmers have sold salt at VND1,600-VND1,800 a kilogram of white salt and VND900-VND1,000 a kilogram of black salt. If the price maintains till May, this year crop will be a success beyond expectation. 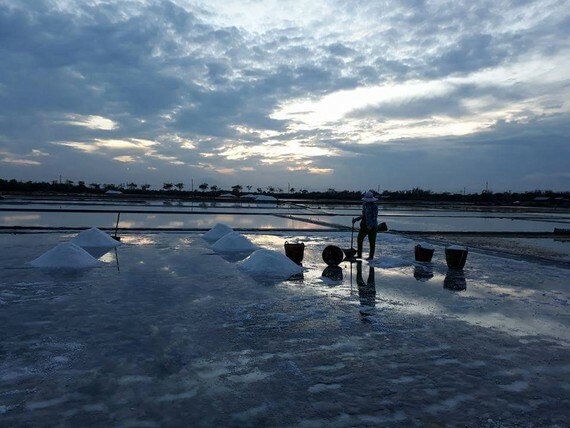 Chairman of People’s Committee in Ben Tre Province’s Thanh Phuoc Commune Vo Bang Truc yesterday said farmers were harvesting the salt crop adding that 300 hectares of salt in the commune has good productivity thanks to hot weather. At present, with the price VND900- VND1,000 a kilogram of for black salt at paddy, farmers have had good profit. Meantime, in Long Dien Dong, Long Dien Tay and Dien Hai in Bac Lieu Province, farmers are run off their feet to harvest the crop. 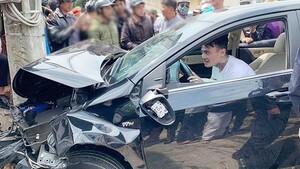 Head of the Department of Agriculture and Rural Development in Dong Hai District Nguyen Truong Han said that farmers in the district have harvested 45-60 tons per hectare of farm of approximately 1,400 hectares of farm thanks to hot weather. More importantly, price of salt is higher than last time. White salt was sold at VND1,600-VND1,800 a kilogram of and black salt fetched VND900-VND1,000 a kilogram. Salt farmers in Dong Hai said that they work hard on the paddy in the sun. In previous years, salt price had been low and difficult to sell, many households in the coastal land have quitted the job. In Dong Hai, a basket of salt of Bac Lieu Province, hundreds of hectare of salt have been converted into aquatic breeding farms. Subsequently, the salt paddy land will shrink gradually if price of salt keep going down.